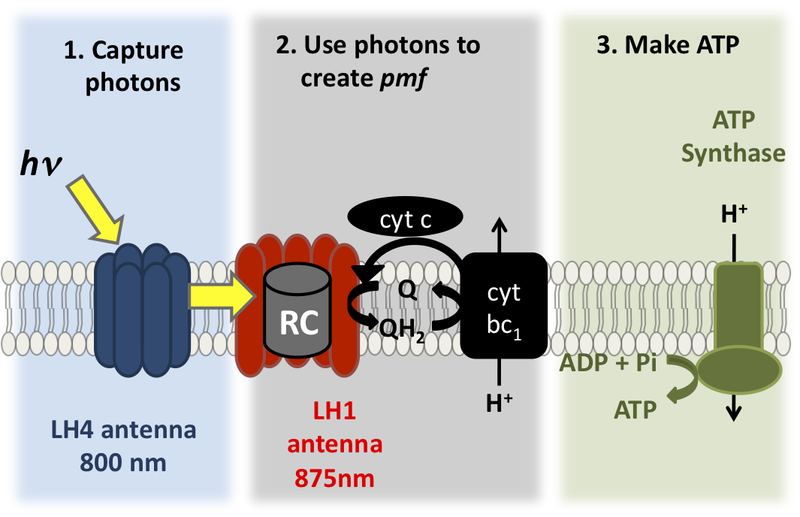 One of the simplest forms of photosynthesis, termed cyclic photophosphorylation, is carried out by the bacterium Rhodopseudomonas palustris (Rpal). Rpal generates energy from light under anaerobic conditions and it grows and modulates the components of its photosynthetic apparatus at a range of light intensities from high to low. We have found that the intracellular redox status of Rpal is modulated in response to the intensities of light used for cellular growth. This has put us in a position to study mechanisms by which redox status can modulate central metabolism and product formation without the complication of worrying about reactive oxygen species. In collaboration with scientists at the Pacific Northwest National Laboratory (PNNL) and the Environmental Molecular Sciences Laboratory user facility at PNNL we are using proteomic approaches to identify thiol-containing proteins in Rpal that are labeled with thiol-reactive probes. From initial results we have evidence that several enzymes that are important for bioenergy production may be sensitive to redox regulation. These could constitute targets for optimization of pathways important for bioenergy production.